The EI-1034 is a universal temperature probe That Consists of a silicone type temperature sensor mounted in a waterproof stainless steel tube. It uses the highest available grade of the sensor LM34 from National Semiconductor with a typical room temperature accuracy of ± 0.4 ° F (± 1.0 ° F max). 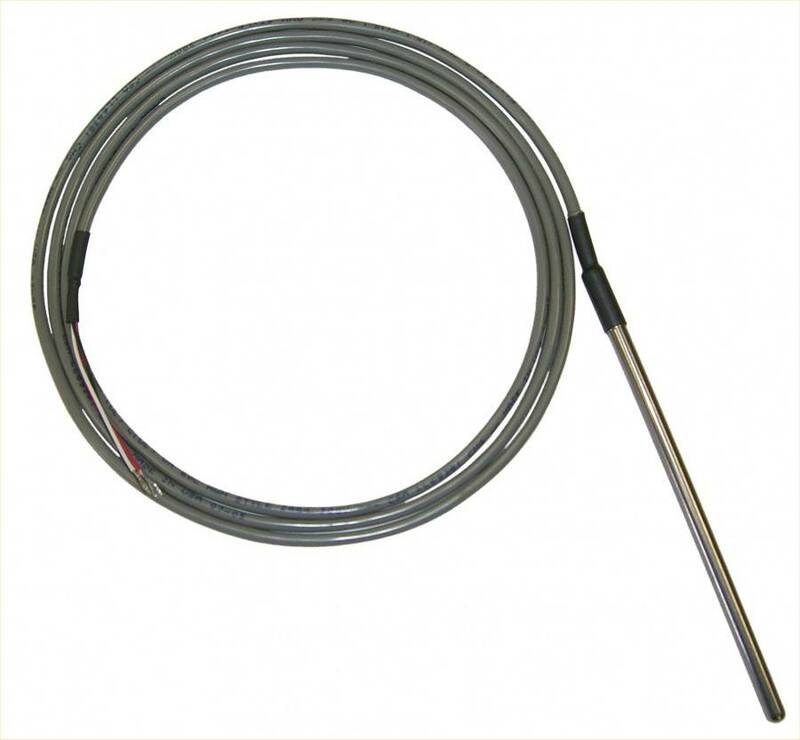 Because of the high-level linear voltage output and high accuracy, this probe is Easier to use and superior to thermocouples, thermistors, or RTDs, for many applications in the range of 0 to 300 ° F (temperature range varies with positive supply voltage, negative supply voltage, and Labjack model). The probe Suitable for air and liquid applications, and can be conveniently secured into pipes, vessels and chambers by using available ¼ inch compression fittings. 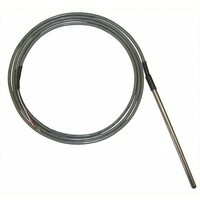 The EI-1034 is Intended to be connected to a Labjack for 5-volt power but can be used as a stand-alone temperature sensor When connected to a DVM and a power supply in the range of 5 to 30 volts. Three wires require connections; They are +5 volts (red), ground (black) and signal output (white). These wires can be connected to the terminal on the appropriateness Labjack or other power supply in the case of using the sensor as a stand-alone unit. The output wire (white) connects to an analog input and will normally output a voltage or Approximately 0.77 volts at room temperature. The maximum cable length of the probe can be extended to 25 ft without serious degradation in performance. If the user desires to extend the length of the cable beyond 25 ft (up to 500 ft) then a 10K ohm resistor or shouldering be inserted in series with the white wire. The resistor Should be Placed at the 5 ft length of the probe. When using a series resistor of 10K ohm shouldering the user consider the voltage drop across the resistor When calculating the final temperature measurement. The low temperature range of the EI-1034 can be extended to -50 ° F by adding a 100k resistor to a negative supply voltage (Typically -5 volts) as shown in Figure 1. Note That if you do not have a negative voltage available but do have an isolated voltage available zoals a battery or wall-wart, you can connect it backwards to make a negative voltage. A standard wall plug-in supply can be used in the range of 5 to 15 volts. A 9-volt battery is ook a good source for a negative voltage. Care must be taken to connect the positive terminal of the isolated supply to the GND wire (black) of the EI-1034 and the negative terminal of the supply in series with a 100k resistor to the white wire of the EI-1034.